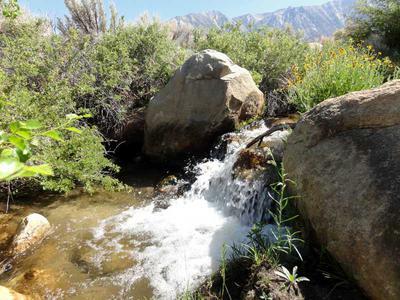 Tuttle Creek Recreation Area is situated in a high desert along the icy cold waters of Tuttle Creek in the Eastern Sierra. It’s a gorgeous camping area. The town of Lone Pine is nearby, making it convenient, and there's a spectacular view of the mighty Sierra Nevada Mountains. Although camping isn't free, the fees are about the lowest I've seen. Camping is $5.00 a day, $100 a month, or $300 for the whole summer season (7 months). The campground is open year round. Campground Directions: From Hwy 395 in Lone Pine turn west on Whitney Portal Road and drive 3.1 miles. Watch for the Tuttle Creek sign and turn left onto Horseshoe Meadow Road. Follow the road south for 1.7 miles. Watch for another sign where you'll turn right onto the entrance road...if you crossed Tuttle Creek you've gone too far. The entrance road is right before the creek crossing. The recreation area and campground are about a mile up the road. There are trout in this very small creek and some are large enough to make a fine meal. I attempted to fly fish with my pole. No luck though. You’ve got to be real sneaky as the water is crystal clear and the creek is so small the fish have no problem spotting you. Most of the creek is choked with trees and shrubs and there are only a few places to access the water. Most of these access spots are here at the recreation area. The creek is beautiful though, once you find your way to it. Wildflowers including Indian paintbrush are blooming along the creek, enhancing the beauty. It’s incredible to see the flowers, crystal clear water, and trout among this otherwise desolate and bone dry desert. The towering Sierra Nevada Mountains are likewise incredible as they shoot skyward from the valley floor. It’s a whole other world up there - brimming with water, meadows, forests, and wildlife. The clear blue lakes are amazing. Recreation: I’ve seen people camp, fish, bike, and just relax or read. There are no trails at the recreation area, but it’s easy to hike cross country in any direction. Hiking along the creek and stopping at each spot you can access the water for a closer look is fun. At the west end, on the south side of the creek, there is a jeep road that’s quite sandy and it roughly follows Tuttle Creek up the slope. This road eventually leads to the trailhead for Ashrama, the Stone House. 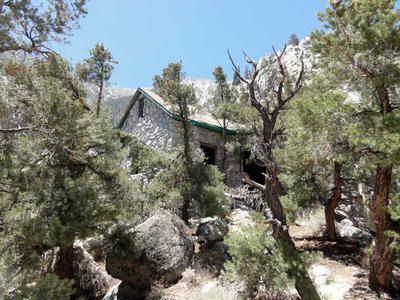 Ashrama, The Stone House: I did a hike up Tuttle Creek Canyon to the Stone House, aka Ashrama. I found the trail with Google Earth. I did not know of the stone house until I reached it, so it was quite a surprise to find it at the end of the trail. The trail used to be a road which was built to bring supplies to build the house. The house was meant for a summer camp. It is astonishing to see this stone house way up in the mountains surrounded by wilderness. It must have taken some extremely hard work to achieve that. The mountain scenery is breathtaking along this hike. After filling my water bottles directly from Tuttle Creek, I headed back along the trail. I was almost back at the trailhead when I heard a rattle. I knew instantly what it was, and froze before taking another step. When I looked down I could see the rattlesnake right beside the trail...and I was just about to step on it. Whew! That was a close one! Whitney Trail to Lone Pine Lake: One day I hiked Whitney Trail to Lone Pine Lake and on the way back I hiked a ways up the North Fork Lone Pine Creek Trail. 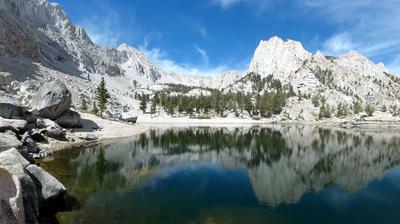 Lone Pine Lake was beautiful – blue waters surrounded by white granite and green forest. It felt like the top of the world. From that hike I decided I have to do the rest, to the top of Mount Whitney! I saw several backpackers making their way along the trail to the summit. I wasn’t sure some would make it. Their packs appeared way overloaded and they were starting quite late in the day. They were slugging along and trying hard to catch a breath. I told my Dad that if these people can make it, we’d have no problem. You have to apply for a permit months in advance so it’s never too early to plan a hike up Mount Whitney. North Fork Lone Pine Creek Trail: Hiking up the North Fork of Lone Pine Creek was incredibly steep. Once crossing the creek it gets even steeper and soon you’re hiking right on the edge of a cliff. That’s about the time I decided to turn around. Five hikers/climbers continued up the trail with heavy backpacks for a 3 day outing to Iceberg Lake. It by no means looked easy – probably twice as difficult as the hike up to Mount Whitney. Meysan Lake Trail: Yesterday I hiked Meysan Lake Trail and had some of the most stunning views so far. Meysan Lake is a large lake and quite a diamond in the rough. The lake has deep blue waters and the white sand/gravel beach appears out of this world. If someone had told me this was the highest lake in the world, I would have believed it. It looks like the Caribbean at 11,000 feet. Too bad the water didn’t feel like the Caribbean – if it had I’d of gone for a swim. It was refreshing to drink, but would make one icy bath. There’s lots of green up here and lush meadows saturated with snowmelt. There were several trout in Meysan Lake and hundreds of tadpoles in the smaller ponds – this place must really start hopping in a month or two! It’s very colorful up here with more wildflowers than I’ve seen anywhere in the Eastern Sierra so far. I didn’t see too many hikers, though I did talk to a family of four who were backpacking. They had just come down from Lone Pine Peak - I'm guessing the kids had one heck of a summer vacation! I saw two other hikers, and heard two mountain climbers on Mount Irvine. Besides the Sierras Nevada Mountains, there's the Alabama Hills, which have plenty to explore too. There are a few dirt roads off Horseshoe Meadow Road that lead to the Alabama Hills. Then there’s well known Movie Road off Whitney Portal Road which is the most popular route through the hills. Narrow Tuttle Creek Road snakes through the hills and is a fun road to take, especially while riding a bike going downhill – check your brakes and hang on tight! Peacefulness: Tuttle Creek Recreation Area is extremely peaceful. The campground never comes close to filling up. Typically there are around 10-20 campsites occupied, out of 81 campsites total. The only noise comes from the fighter jets that train above. Thankfully they don’t fly right above your head and scare the bejesus out of you, like they do on the valley floor! Five or so jets a day is common. Weather: I've been camping here at Tuttle Creek Recreation Area for 3 weeks now. There was a heat wave soon after I arrived with temps near 100 for several days. Then it cooled down to the 80s. Now we're seeing another heat wave with highs near 104 forecast in a couple days. I believe this is much hotter than the norm. Lows have been around 60. There’s almost always a breeze here, which is nice when it’s hot. I haven’t had any extreme wind, just a few gusty days. Nights are usually mostly calm. No rain, and only a few days with clouds. I’m starting to wonder if it ever does rain here. From what I hear they don’t have a monsoon season like Arizona and the Sierra Nevada Mountains block most rain from reaching the valley. Wildlife: At and near camp I saw great blue herons (yes, in the Eastern Sierra! ), trout, smaller fish, ground squirrels, cottontail rabbit, snake, lizards, gambel’s quail (very common, they pass by my campsite and cross the road often), ravens, turkey vultures, hummingbirds, and many other birds. While hiking Meysan Lakes Trail I saw marmots, chipmunk, tree squirrels, ground squirrels, robins, hummingbirds, turkey (a hen and her chicks), tadpoles, trout, mosquitoes (yikes! ), lizards, and several varieties of birds. While hiking Whitney Trail and North Fork Lone Pine Creek Trail I saw whitetail deer, several birds, ground squirrels, tree squirrels, and lizards. On my hike up Tuttle Creek Canyon to the Stone House I saw a rattlesnake which I nearly stepped on. Insects: Couple gnats, no problems. Cell Signal: My Verizon cell signal was excellent. It was a little better at Campsite #33, which was higher up the slope, but I usually had 3g service, sometimes 4g here at Campsite #70. Signal strength is usually 3-4 bars. Verizon mobile broadband internet is pretty fast too. Water/RV Dump: Tuttle Creek Recreation Area has potable water and a dump station with non-potable water. The dump station is not included in the camping fee and is $5.00. Tuttle Creek Recreation Area Campsite Rating: 10 out of 10. The views are awesome with the Sierras above and Owens Valley, Owens Lake, and the Alabama Hills below. 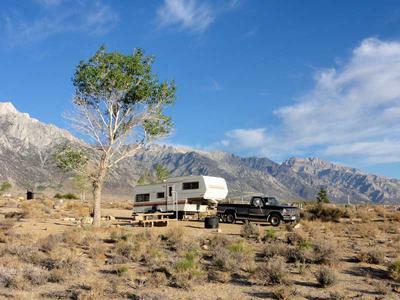 The weather is pleasant (most of the time), Lone Pine is close for supplies, there’s water and an RV dump, and there's plenty of high adventure to be had in the area. Join in and write your own page! It's easy to do. How? Simply click here to return to Free Camping Northern California.